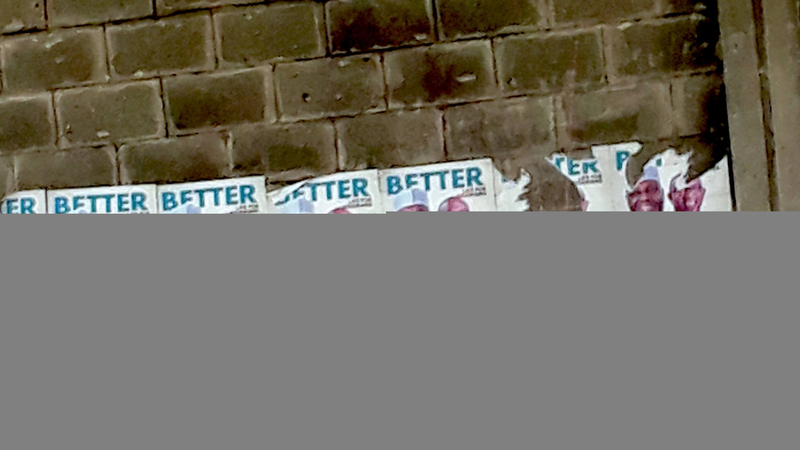 Defaced campaign posters on a wall in Lagos, Nigeria. Image by Nwachukwu Egbunike, used with permission. With Nigerian national elections around the corner on February 16, 2019, the Independent Electoral Commission (INEC) and the National Orientation Agency have shown concern for void votes — those deemed invalid by INEC. Voter apathy and low turnout (absentee rejections) is a form of void votes. Unraveling the reasons behind voter apathy is essential for minimizing void vote. Looking back on 2015 elections, the INEC Summary of Results shows that the number of votes cast (29.4 million) was less than half the number of registered voters (67.4 million). Of these registered voters, 31.7 million showed up on election day and were accredited by the INEC. But only 28.6 million were valid votes while 844,519 were void and rejected. If all registered voters had cast their ballot in 2015, and the number of rejected votes increased by the same amount, it would come to about 4 percent — a negligible number. On this assumption, low turnout at elections (rather than the number of rejected votes) is a more worrying form of void votes. The consolidated number of registered voters for the 2019 General Elections is 84 million — 44 million are male while 39.5 million are female. Over half — 51 percent — are youth ages 18-35 whereas nearly 30 percent are middle age (36-50). Just 15 percent are elderly (51-70) and nearly 4 percent are old (70 and above). Digital natives (youths) and digital immigrants (middle age) make up 81 percent of registered voters in Nigeria. Internet users in Nigeria grew from 98.3 million in 2017 to 100.5 million in 2018. Facebook maintains the lead as the social media platform of choice with 22 million users, followed by YouTube (7 million+), Twitter (6 million) and Instagram (5.7 million). The majority of voters in this year’s election have been using digital technologies since birth or transitioned from analog to digital technologies — digital media is not an alternative but rather, simply, the media. In the prelude of Nigeria’s 2015 presidential elections, Twitter became the space for political conversations for young voters. Discussions were hot and bitter — trenches were dug and supporters of both All Progressive Congress (APC) and Peoples Democratic Party (PDP) got involved in an unending cycle of accusations and counter-accusations. Within this divisive environment emerged a class of non-aligned people called the “Fencists.” They are not undecided voters, but rather decided voters who reject the need to express their political support on Twitter. Fencists held that neither of the two candidates in the 2015 presidential elections was “Messiahs” and time has vindicated their stance. Fast forward to 2019, this same group of politically conscious youth and middle-aged Nigerians have been campaigning for people to get their Permanent Voters Card (PVC). These potential voters don’t necessarily need education on void votes, but they seek a firm guarantee that this year’s election will be free, fair and credible — that their votes count, period! The credibility of elections depends primarily on a transparent voting process. E-voting would appeal to young and middle-aged voters because of their comfort with technology, significantly reducing voter apathy with a viable, transparent process. In March 2017, the Nigerian Senate approved the use of Electronic Voting when it passed an amendment to the Electoral Act Number 6 2010 into law. E-voting received wide acclaim because it guarantees free, fair and credible elections. However, on December 8, 2018, President Muhammadu Buhari declined to sign the bill “for the fourth time in two years”. This closed the use of e-voting in the 2019 general elections. E-voting would have entailed significant changes, including the full biometric accreditation of voters with Smart Card Readers. The electoral officers would be obliged to instantly send accreditation and election results from polling units to the corresponding collation center. Also, officers in charge of the elections must record accreditation data and polling results on INEC’s prescribed forms, which must concur with what was recorded, before transmitting them. Nigeria's electoral umpire, INEC, would have had unlimited powers to conduct elections by electronic voting. In addition, the collation of election results would have been done electronically and would have helped to determine final results on a real-time basis. E-voting may not happen any time soon because the government, along with elderly and old constituents, just about 19 percent of the electorate – insist on having an analog election in 2019. Constitutional amendments guarantee INEC’s independence after woeful 2007 presidential elections, marked by fraud and violence. The president can no longer unilaterally hire or fire the INEC chief without a confirmation from the Senate. Yet, these electoral reforms have not done enough to address void votes during elections. If the majority of voters are digital natives and migrants, E-voting makes the most sense because it meets the majority of voters where they spend most of their time. Documentaries, short video clips, podcasts, webinars can be employed with explainers in English, Nigerian Pidgin, Hausa, Igbo and Yoruba — Nigeria’s most widely-spoken languages — on milestones and improvements in the electoral process. Education that emphasizes historical narratives on Nigeria’s democratic evolution from the First Republic to date would help convey the value of voting. Understanding the sacrifices of those who died to make Nigeria's democracy in the past 20 years possible is crucial. Do Nigeria's youth remember the June 12 martyrs, those who fought — albeit unsuccessfully — to restore the 1993 presidential election which was annulled by the military government? Online education must also emphasize how voter participation is key to a successful election. Voters are the missing link to a strong democracy.